Red, burning, uncomfortable, stinging, watery, inability to wear contacts all day, waking up in the middle of the night for no apparent reason, and general dryness are all common complaints that I regularly hear that describe common symptoms of Dry Eye Syndrome (or DES). DES is a very misunderstood disease by the public in general. It is my personal opinion that not enough Optometrists and Ophthalmologists are taking the initiative or getting aggressive enough with identifying and treating the disease. I have many patients at my office thank me on a regular basis for the relief I have helped provide. Many patients simply live with this disease and do nothing because they believe it is normal. YOU MUST get the conversation going with your eye doctor (and eye doctors: PLEASE ASK your patients) in order to identify that there is a problem in the first place. The symptoms are typically MUCH worse than the signs, which many times are subtle. As we get a little older, subtle hormonal changes, especially in women, make the lacrimal gland produce less tears and the tears also become of lower quality. Many times the disease is caused by the thyroid gland producing too little thyroid hormone. For example, I have around 70% of my patients that take prescription Synthroid (Levoxothyroxine) on some sort of regular treatment regimen. 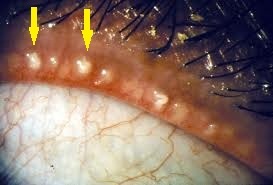 There are a number of small glands that line the inside of the eyelid margin just behind the lashes. These meibomian glands secrete one of the three layers of the tear film - the layer responsible for keeping the tears smoothly covering the surface of the eye. Many times, these glands are capped off, appearing like small “whitehead pimples” which are actually tiny sites of bacterial infection and inflammation. I typically press on these glands with a “medical q-tip” with the use of a local ophthalmic anesthetic on any dry eye patient. Many times, I cannot even tell if this is part of the problem until this procedure is performed. I recently had a new patient who was on ophthalmic steroid ointments for YEARS (who ultimately had the steroidal side effect of cataract formation requiring cataract surgery at a relatively young age). I expressed the glands, and he called days later saying his eyes have never felt better. This patient is now steroid-free. In other cases, the lacrimal gland may just not be producing enough tears for no apparent reason. 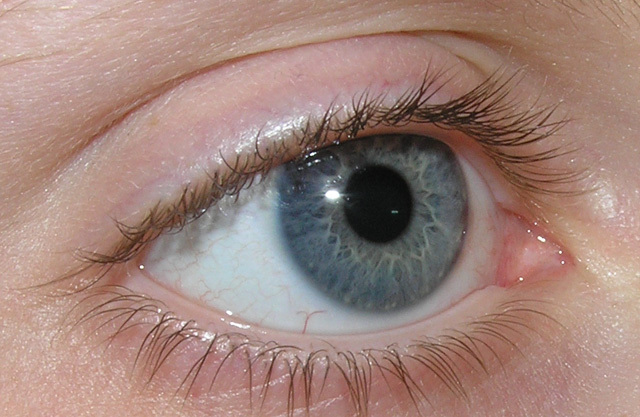 The eye may be having a reaction to the type of material a contact lens is made from. There might be a mechanical defect with the structures around the eye, such as a tear duct that is too large or an eyelid that does not completely close. The list goes on. Many times these cases are multifactorial, i.e. there are a combination of causes that must be considered. Good thing there are many options for relief! Most DES cases are chronic in nature, that is, any real treatment will never “cure” the disease, so the patient must make a commitment to stick with the prescribed plan. OTC Artificial tears: I personally believe these are recommended way too often. They may provide temporary relief, but do nothing to go after what is causing the DES. I only recommend these when they are ultimately a part of a bigger regimen, generally to help damaged corneal tissue heal quicker. Punctal Plugs: These work great once in a while for the right patient, but I find that patient to be rare. Plugs are used to close the puncta, the natural hole we all have that drains our tears. By plugging this, many times the dust, pollen, and debris that naturally gets in the eyes now collects as it has nowhere to go, many times increasing discomfort and inflammation. I typically will not start here, and have probably removed plugs from more new patients than inserted new ones combined. Diet: It is clinically proven that getting more fish oils, Omega-3s, and healthy fats in the diet will help the lacrimal gland produce more, healthier tears. Obviously getting these oils naturally is always best, but supplements certainly are better than doing nothing at all. Artifical Tear Ointment: Genteal® and Lacrilube® OTC lubricants are my personal favorite. I use these in patients where there has been moderate to extreme dryness, or where the eyelids are not closing all the way at night. These lubes are much more viscous (or thicker), thus they stay on the eyes much longer, but they do blur the vision, so their use is limited. Hot Compresses: When the clogged glands are part of the issue, using a hot warm washrag draped over closed eyes a few minutes each day can help. The heat helps open up the clogged pours, and the massage of the fingers gets the secretions moving along. Lipiflow®: This new medical device can work wonders for the clogged meibomian glands. It is designed for that specific purpose. There is presently only one Lipiflow® device I am aware of in my office’s area. I will refer candidates for a consultation with the Cornea Specialist I work with: Dr. Randy Epstein’s Chicago Cornea practice. Unfortunately, the procedure is presently not covered by medical insurance and costs more than a thousand dollars each treatment. But no doubt someday it will be and we will likely have one in-office. Restasis®: This medication works very well, I prescribe it quite often. I prescribed it for six new patients last week alone. Restasis® (cyclosporin ophthalmic emulsion 0.05%) is Rx only and the only Rx treatment that goes after the inflammatory component of DES. This drop is used twice per day and covered by most medical health insurance plans. The downside (and the high patient dropout rate many practitioners complain about) is that the medication takes AT LEAST 2 MONTHS for patients to see the full benefit as it must build up in the patient’s system. 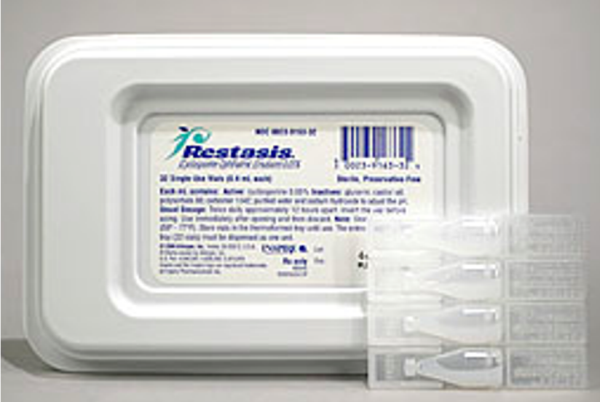 Restasis® ends up working very well for around 80% of the patients I have started on it. Contact lens materials: The best soft contact lenses for ANYONE with DES are 1-day throw away soft contacts, period. The materials in these lenses are designed to purposely break down very quickly, allowing them to be exponentially more comfortable than traditional planned replacement lenses. The costs of these lenses have been decreasing significantly the past few years, and newer generation materials just keep getting better and better. I frequently get patients back into comfortable contacts who were previously unable to wear them because of dryness issues. Ophthalmic Steroids: These are generally reserved for the more serious cases when other treatments are simply not enough. Long term side-effects, like cataract formation, are a concern with continued steroid use. However, they do have their place and discomfort is typically quickly reduced. In summary, it is easy to see that simple dryness-like symptoms are not so simple at all, and may require medical attention. If you are experiencing any of these symptoms, get the conversation going with your eye doctor to identify the cause and get relief! Dr. Andrew Neukirch is an Optometrist and CEO of Carillon Vision Care located in Glenview, Illinois. You may contact him directly here. Thank you for sharing this useful information in terms of eye care. Some people are suffering of eye damage or eye infections and they are looking for a reliable eye doctor that provides good services and good results.